Prices for flights offered by Qatar Airways will be competitive, Hugh Dunleavy, the company’s Chief Commercial Officer, told media Monday. “Our pricing policy will depend on positioning, competitiveness and other factors, but I assure you that Qatar Airways will provide affordable prices for Armenian citizens,” he said. 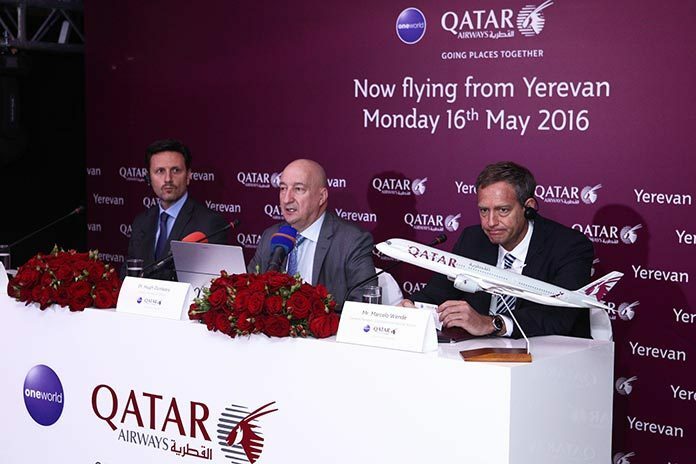 Qatar Airways will carry out Doha-Yerevan regular flights four days a week. Flights will be operated by Airbus A320 aircraft, providing 12 business and 132 economy class seats. The A320 aircraft will carry up to 48 tons of cargo flights from Yerevan to Doha route, as well as across the whole network of Qatar Airways. According to the official site of the Airlines, prices of economy class tickets range from 178 euros (about $200) to 670 euros (about $750), while prices of business class tickets start from 772 euros (about $860) to 2,500 euros (about $2,800). The company’s commercial director said that Yerevan will be connected with different points of the world through flights of 150 routes. “By this, we want the world to connect with Armenia and vice versa. Being a young company, during 19 years we were able to acquire 184 modern aircraft, which carries flights to 150 destinations in six continents of the world,” he said. Marcelo Wende, the General Manager of Armenia International Airports CJSC said that Armenia has the open sky policy, which they have pursued for years. “Qatar is important for us, because it communicates with many countries of the world, and it creates a great opportunity for Armenia. Qatar gives us the possibility of bringing to Armenia not only the people from Armenian Diaspora, but also tourists from other countries,” he said. Qatar Airways is one of the largest airlines in the Middle East. Its fleet consists of more than 340 modern aircraft, and the Doha airport can be a convenient transit point for people travelling from Armenia to the USA, the Middle East and Far East.